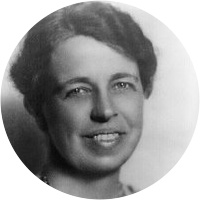 A collection of the best Eleanor Roosevelt quotations. Democracy cannot be static. Whatever is static is dead. The first freedom of man, I contend, is the freedom to eat. In business courtesy and efficiency have a symbiotic relationship. Talking too much is a far greater social fault than talking too little. Strength that goes wrong is even more dangerous than weakness that goes wrong. Friendship with oneself is all-important because without it, one cannot be friends with anyone else in the world. Ability is not something to be saved, like money, in the hope that you can draw interest on it. The interest comes from the spending. Unused ability, like unused muscles, will atrophy. About the only value the story of my life may have is to show that one can, even without any particular gifts, overcome obstacles that seem insurmountable if one is willing to face the fact that they must be overcome; that, in spite of timidity and fear, in spite of a lack of special talents, one can find a way to live widely and fully.